With the glaring spotlight placed on cybersecurity breaches during the second half of 2013, I started tracking cybersecurity-related stocks traded on the big exchanges with the assumption that the companies I chose to follow would have a very robust 2014. So far my assumption has proven to be true. Of the 13 (mostly pure-play) publicly traded cybersecurity companies I've followed (see table below), only three experienced declines during the first two months of the year, with most gaining double digit boosts between the close on January 3 and the close on February 28. I created a cybersecurity stock index to see just how well this group of companies performed on the whole in comparison to the broader market. 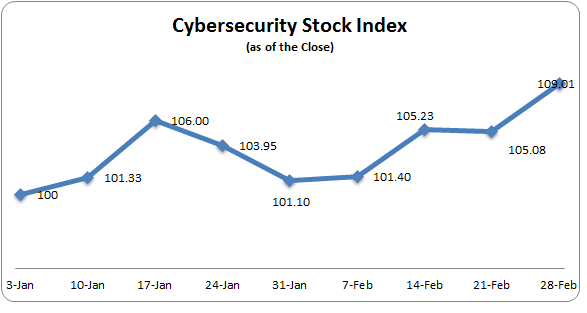 Based on this index, the cybersecurity companies advanced 9% during the first two months of 2014, more than twice the growth in the Nasdaq Index, four times the performance of S&P Index and almost ten times the rise in the Dow Jones Industrial Average. And if this week is any indication, cybersecurity-related companies are poised for even bigger gains - two of the newest cybersecurity players on Wall Street soared today - next-gen threat protection company Fireye (NASDAQ: FEYE) soared 8.44% today to close at 95.63 while firewall provider Barracuda Networks jumped 9.29% to close at 38.48. Stay tuned as I periodically update the trends.